Leaders in Congress have shown that they don’t have the political will to decrease runaway federal spending, and no other area of the budget more clearly demonstrates this than what America spends on war. 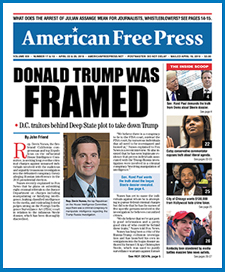 In this issue, AMERICAN FREE PRESS takes a hard look at war spending, including what taxpayers could save if Washington’s top policymakers suddenly grew spines and stood up to the military-industrial-banking complex. Tragically, three men in the House of Representatives who have most frequently spoken out about the need to cut Pentagon expenditures will no longer be serving after next year. Rep. Dennis Kucinich (D-Ohio) lost his bid for re-election in the 2012 Democratic primaries. Rep. Ron Paul (R-Tex.) will retire at the end of this term. Rep. Barney Frank (D-Mass.) announced that he plans to walk away from politics at the conclusion of 2013. On November 7, Kucinich blasted President Obama for his continued use of drone strikes overseas. During the September 12 GOP presidential debates, Paul angered the majority of his party by criticizing what he felt was wasteful spending due to rampant imperialism. The Economist, a premier business and financial publication, recently opined that Obama has not taken serious measures to reduce war spending. Why Not Cut Foreign Military Handouts? As Congress and the White House debate tax increases and cutting much-needed tax deductions for mortgages as a way of preventing the country from plummeting over the proverbial “fiscal cliff,” an important topic has been left out: the billions in military giveaways to foreign nations. After all, why are hardworking citizens, who are pursuing the American dream, penalized while other nations receive free money in the form of missiles, rifles and bullets? In fiscal year 2010, the U.S. forked over $6.5B in armaments to nations such as Israel, Egypt, Pakistan and others. Not included in this figure were direct expenditures for the wars in Afghanistan and Iraq. When bombs and weapons sent to these two countries are factored into the equation—at a total of $7.8B—overall U.S. outlays on military aid surpasses $14B. It goes without saying that Israel was the number one recipient of American military handouts in 2010 at $2.8B. In 2011 that amount rose to $2.99B and in 2012 it topped $3B. When discussing the subject of waste, Reid drew upon firsthand knowledge. Reid turned his attention to other areas where money is squandered. And the costs of war include more than just those calculated in terms of dollars. Reid brought up the case of a woman who once worked as an administrative nurse. On top of post-traumatic stress disorder and the sickening effects of depleted uranium, a weapons component, Reid also cited substance abuse and rampant unemployment as major problems. Do We Need Bases in 148 Nations? All countries in the world, when combined, spend a whopping $1.5T per year on their militaries. Of this total, the United States Department of Defense budget alone comprises 47%, or a staggering $707.5B. But even this figure is misleading. In 2010, military expenditures accounted for 20% of the U.S. federal budget. But since the U.S. has run annual trillion-dollar deficits over the past five years, military outlays eat up 28% of all tax revenues. If other Pentagon-related expenses are added to this sum, researchers estimate that these disbursements consume approximately 50% of all collected taxes in the U.S. Compared to other nations, communist China ranks as the undisputed number two military spender at $129B, or about 20% of what the U.S. goes through. Russia only sets aside half of what China does for its military, followed closely by France, England and Japan. Rounding out the top ten—all of whom spend in the neighborhood of $40B—are Saudi Arabia, India, Germany and Italy. One of the primary reasons America tops all others is its insistence on maintaining bases in as many as 148 countries. The Pentagon deploys nearly 200K active military personnel on foreign soil, though in 56 of these nations the total number of U.S. occupying soldiers is under a dozen. Why does the U.S. have 238 troops in Diego Garcia, which some people might think is the name of a Spanish soap-opera star? Why does the Pentagon have 1,380 men living in the tiny country of Djibouti, an African nation whose main exports are live animals? And why does the Defense Department keep 1,250 troops in Belgium, a country that hasn’t declared war on anyone since 1940, and when they did, it was against only one country: Italy.